Alastair Campbell’s colourful and candid life has seen him scale the heights of journalism and politics, with two breakdowns over the course of 30 years. Reflecting on a past which included rebuilding his career, he tells Happiful his fears of an "anxiety epidemic"
So, are we talking to Alastair the strategist, the editor, the campaigner or author? You’re talking to me [laughs]. Today, I’ve done radio interviews about Brexit, so you’re talking to an anti-Brexit campaigner and the editor-at-large of the New European. I’ve had a conversation with my publisher about my upcoming novel, Saturday Bloody Saturday, and my co-author Paul Fletcher about its launch. I try to do something everyday to promote mental health, be it writing, speaking, advising, consulting, strategising. If I mentioned 1986, Scotland, Neil Kinnock’s tour, what comes to mind? Were there any warning signs? Looking back, there was a big build-up that I didn’t see at the time. I didn’t feel anything; I thought I was invincible. My mind couldn’t cope with it, and it just exploded. Were you adequately supported at the time? My partner Fiona would say no. I was at a newspaper called Today and she was saying to them: “He’s cracking up.” My bosses replied: “No, he’s brilliant, he’s a whirlwind and he’s doing clever things.” So, I don’t hold them responsible. Looking back, when I was with the Mirror beforehand, there was a big drinking culture. I certainly felt supported there and in politics when I went back to work after my breakdown. I felt people were conscious that I’d had a bad experience and was trying to rebuild myself. Tony Blair didn’t realise how bad my depression was at times. I never felt I couldn’t pull out or raise a problem if I had to. However, I think a lot of people in the workplace feel they can’t even raise their problem. You were headhunted in 1994 to work for Tony Blair. Did you have doubts about your suitability for the role? I did, and that’s why it took me so long to say yes. I remember saying to Tony: “Look, I have cracked up before.” I was drinking before though, and I wasn’t in 1994. But the pressures that made me crack before would only be greater. Was he ahead of his time in terms of his understanding? I don’t think it was a level of understanding; he had known me for several years. Having seen how I had recovered from the breakdown, gone to the bottom of the Mirror and rose up to Political Editor, he had perhaps thought about it. I raised my mental health history with him and asked: “What if it happened again?” He was confident that it wouldn’t. That said, when he wrote his own book, I did take him to task as he actually wrote a passage that said when it comes to mental illness, there are those who are crazy and those who are a bit crazy, and it gives them this amazing energy and creativity – and that I was one of them. I wrote a blog saying hold on a minute, that’s not how it works. Did he mean you were high functioning? I think he meant there was always a very on-edge side of me that you had to be wary of, but it gave me this energy and creativity. There is something in that. But you can’t say there are these mad people and creative mad people. It’s much more complicated than that. We all have mental health. Every single one of us. Some of us get ill, some of us get very ill.
Should we be protecting our mental health? We should, but a lot of people don’t. People think I’ve always been a fitness fanatic, but I haven’t; I was a heavy smoker, big drinker. You wouldn’t necessarily think smoking and mental health are linked, but smoking is creating illness, creating anxiety, and drink definitely does too. I think the drinking culture in areas I know well – media, politics and journalism – is much less than it was. But I think with the general public, it’s embedded. We are a drinking nation. You used to see MPs bouncing off walls when they went into the House of Commons to vote. Is the social media microscope detrimental to mental health? You have real relationships, and then you have these virtual relationships. I think there is some good in it, but schools are now banning phones. Teachers say that kids are looking at them all the time. I was on a train, and there was a young woman on her phone looking at herself and putting pictures out constantly. It was like another universe. Nothing wrong with that on one level, but I don’t know the good it’s doing. You use social media to put your views out on controversial subjects. Are you concerned by the backlash? Maybe my skin has grown too thick. It doesn’t bother me at all. I see the context; there does seem to be a lot of hatred and anger out there for everybody. I think it must put people off from going into politics. So there’s no anxiety at all after tweeting out your views? Not at all, it’s not good to stop saying what you think. I’m not one of those who puts themselves in the Katie Hopkins and Toby Young category where that person wants to be talked about. I am interested in saying what I think, and like a robust argument and engaging on that. People are more understanding when you do nail your colours to the mast. Who do you think’s got it right, or wrong, with mental health? Theresa May and Jeremy Hunt talk the talk. I think the expressions of mental health as a priority are good. But, you have to judge them by what’s been delivered. I don’t think the delivery has been good. My big worry is that, we’re winning the battle for better understanding and awareness, but more and more people are thinking: “Maybe I am in need of mental health support?” Then they’re finding the services aren’t there. I wish they would stop saying it’s a priority and not doing anything about it. If you were the Director of Communications for the PM, what would you do? They have got to match their words with policy. There’s loads of stuff that could be done. I accept money is going to be tight, but my big worry is that they are using the awareness battle as a substitute for policy. I would like them to say: “We all have mental health.” I would like them to stop thinking only of mental illness; we have to invest in people’s mental health. That would take me into areas of education and sport – the preventative side of things. I don’t think they do nearly enough on that. In terms of when they’re making decisions on funding, stop making it the easy area that always gets cut first. Build a long-term plan. There’s definitely something going on with young people and anxiety; if you’re not making sure young people get the help they need, it’ll cost you more in the long-term. Sweden has launched a mental health ambulance. Does the UK need a dedicated team? Funnily enough, Fiona and I were walking to an anti-Brexit meeting, and on the way there we saw this guy who was clearly having a psychotic breakdown. He was talking to things that weren’t there and there was a stream of nonsense coming out of his mouth. I said: “Have you got any friends I can call?” I got through to voicemails, and then rang 999 for an ambulance. They take you through a long checklist and I was worried I couldn’t restrain him and that he might hurt himself. Then I was told: “OK, if you can just keep him stable and calm, we’ll have an ambulance there in two to three hours.” I thought they were kidding me. I would say I’m in a reasonably good place. I still get depressed. I still have low moods. I still get a bit manic. I still see a psychotherapist. There was a period in my life where I saw him a couple of times a week, but now I’d say it’s more like months apart. I have developed my own strategy by focusing on the things that matter: my family. For me, creativity and writing help. Saturday Bloody Saturday will be my 14th book, including the diaries. Writing is a form of therapy. Does writing fiction help, instead of reflecting on the past with the diaries? The diaries are quite useful for helping me figure out what to do in the future. I am self-aware enough, and know one of the reasons I get hired to talk to people is because of what I did. I have tried to use that in a positive way. How did you first get involved with Mind? They approached me years ago and were aware of me talking publicly about my mental health. At the time I was very involved with a leukaemia charity, and I said: “I’ll do it, but I don’t want to get drawn away from them.” As time has gone on, I realised Mind and mental health really motivates me, so I have got more and more involved: writing, talking, broadcasting, lobbying with government and businesses who take the wellbeing of their employees seriously – and give them time off when they need it. I was speaking at one of the big banks recently, and they have their own mental health counsellors in-house working full-time, and staff are encouraged to see them. Are you pleased your children have been exposed to mental illness from a young age? My brother Donald, who had schizophrenia all of his adult life, died last year and my children were very aware of that, plus my own issues. There’s no doubt parents worry more about their kids than anything. I hope it helps that both of their parents are very open about mental health. If you could say anything to Alastair Campbell, before the breakdown, what would it be? At the same time, Stephen Fry once said having bipolar is horrible, but if somebody offered him a button he could press to stop being manic, he’s not sure he would press it. If you had the same offer, what would you do? If you said I could press a button and never experience depression again, I think I would take it. But at the same time, if you said as a result of that I might not have as many ideas for campaigning and books and be less creative, I would be worried. So you would press it? [Pause] I think I probably would. But that being said, I know exactly what Stephen Fry meant. Alastair Campbell is an Ambassador for Time to Change, also for Mind and Rethink Mental Illness, and patron of the Maytree Suicide Respite Centre in London. Alastair’s latest novel, Saturday Bloody Saturday, centres on a football manager in the 70s who brings his struggling team to London, where the shadow of IRA terrorism stirs. We’re on a mission to create a healthier, happier, more sustainable society. Our aim is to provide informative, inspiring and topical stories about mental health and wellbeing. We want to break the stigma of mental health in our society, and to shine a light on the positivity and support that should be available for everyone, no matter their situation. If you like our website, then make sure you’re the first to read our digital magazine! Receive a free copy of Happiful straight to your inbox each month simply by entering your email address below. We all have mental health and some of us will experience mental illness – but that doesn’t define who we are we. I am, I have is a new podcast where we’ll be talking with great people, finding out about the passions that shape their lives, as well as their responses to their own mental health. 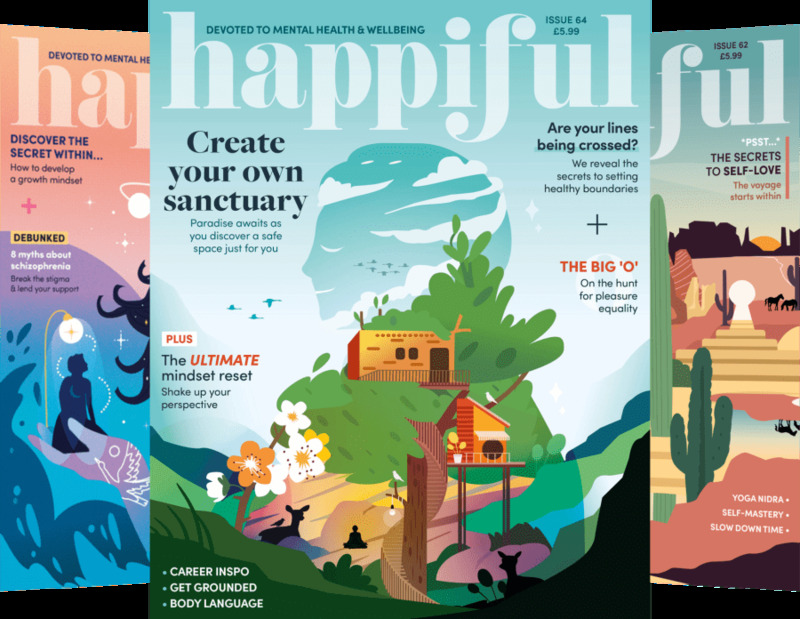 Get happiful magazine delivered straight to your inbox. Would you like to contribute to happiful? Get in touch.